Streamline seeding rakes are widely used in vector field visualization. 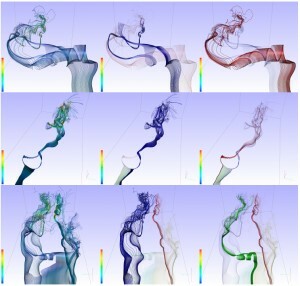 We present new approaches for calculating similarity between integral curves (streamlines and pathlines). While others have used similarity distance measures, the computational expense involved with existing techniques is relatively high due to the vast number of Euclidean distance tests, restricting interactivity and their use for streamline seeding rakes.We introduce the novel idea of computing streamline signatures based on a set of curve-based attributes. A signature produces a compact representation for describing a streamline. Similarity comparisons are performed by using a popular statistical measure on the derived signatures. We demonstrate that this novel scheme, including a hierarchical variant, produces good clustering results and is computed over two orders of magnitude faster than previous methods. Similarity-based clustering enables filtering of the streamlines to provide a non-uniform seeding distribution along the seeding object. We show that this method preserves the overall flow behavior while using only a small subset of the original streamline set. We apply focus + context rendering using the clusters which allows for faster and easier analysis in cases of high visual complexity and occlusion. The method provides a high level of interactivity and allows the user to easily fine-tune the clustering results at run-time while avoiding any time-consuming re-computation. Our method maintains interactive rates even when hundreds of streamlines are used. This entry was posted in Publication and tagged Flow Visualization, Journal paper, TVCG on May 30, 2012 by Mark.